Home / 2am / 2pm / eastwood / k-pop / korean / korean band / manila / meet and greet / megaworld / newport mall / resorts world manila / saint o'clock / this song / venice piazza / 2AM will be here in Manila! 2AM will be here in Manila! The band behind the K-Pop hit "This Song" is about to conquer the metropolis as they are about to meet and greet their fans here in Manila for a four-day tour. Carrying their latest album "Saint O'Clock", the group will be at Megaworld Corporation's Eastwood Mall, Venice Piazza at McKinley Hill and Newport Mall, Resorts World Manila this week! I first encountered this group through this Youtube video that showcases the funny sides of 2pm ( a more popular K-Pop group). This video is really funny considering the built of these guys and their acts, which are all so manly. 2AM became popular through their ballad songs, while 2pm is known from their dance rhythms. The members of 2AM are Jinwoon, Jokwon (the leader), Seoulong, and Changmin. 2AM is one of the two subgroups branched out from the eleven-member boy band One Day, the other being 2PM. They are both under the Cube Entertainment, which is under the management of Park Jin-young of JYP Entertainment. Fans who will avail 2AM's Saint O'clock Special Edition album on the meet and greet shows on April 28 and April 29 will get the chance to have their albums signed. 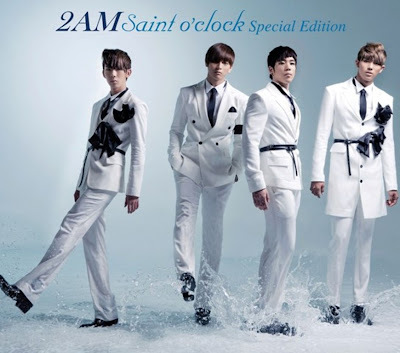 This special edition album features 2AM's all-time favorite songs from the standard Saint O’ Clock album including two more bonus tracks and a DVD of their music videos. So, it's K-Pop weekend for us again!